Dagmar Pinney enrolled in a local arts program in the late 1990’s. After attending several classes and then having the pleasure over the next few years to work privately with some local artists, she started painting seriously in 2002. Since that time she has had the opportunity to study under several other artists and continues to develop a style of her own. Recently retired as a special needs educator and now as an active member of the Kawartha Arts Council, she puts her focus on developing new works as well as working with children helping them open a window into their imagination and to develop the creativity within. At home with her family and dogs, Dagmar is an avid gardener and has transitioned that art form into her paintings. 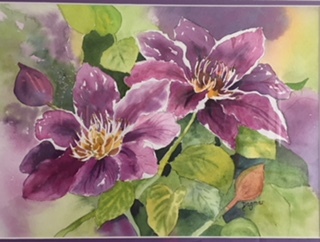 Working with watercolours and acrylics has brought out a passion that she didn’t know she had and continues to develop with each painting. Find Dagmar Pinney on her website.